Here’s a book that’s a little different! It shows you how to find a niche so that you can compete effectively against the big box stores. Find out where to get great ideas and how to direct import your own merchandise. Learn how to research the market for the merchandise that you have selected. Then take a look at the legal structure for your business and how to register for sales tax permits. Think about the importance of location and the hazards of lease renewals. Factors to consider in your layout and store fixturing. Don’t ignore the importance of exterior and in-store signage, lighting and window displays. You’ll find a lengthy chapter which shows you how to advertise and use direct marketing to augment your sales. Look at some of the factors you may want to consider when hiring staff and be alerted to the horrendous increase in theft by staff and shoplifters. Find out how to use planogramming to fine-tune the position of merchandise within your store and how to determine whether you should discontinue certain lines. Extend your reach beyond your bricks and mortar operation by using the World Wide Web to advertise your merchandise. Learn how to set up your own Web site and how to open your own e-commerce store so that you can accept online orders. Also, find out how to drive traffic to your Web site. Finally, why you need a business plan before you start and how to use it to arrange financing. This book will show you how to operate a retail store in the digital age and turn it into a money machine! If you have ever wanted to go into retail, you should start by reading this book first. You’ll get tons of great ideas! Chapter 5 - Location! Location! Location! 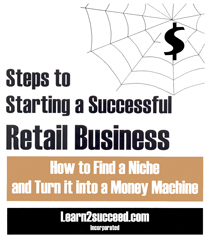 Steps to Starting a Successful Retail Business: How to Find a Niche and Turn it into a Money Machine by: Learn2succeed.com Incorporated: softcover; 144 pages; ISBN: 978-1-55270-359-5; published in 2009; $24.95.